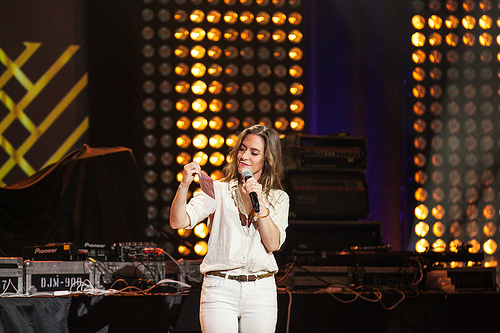 Last year’s winner, Feist, announcing the 2013 Polaris Music Prize winner. 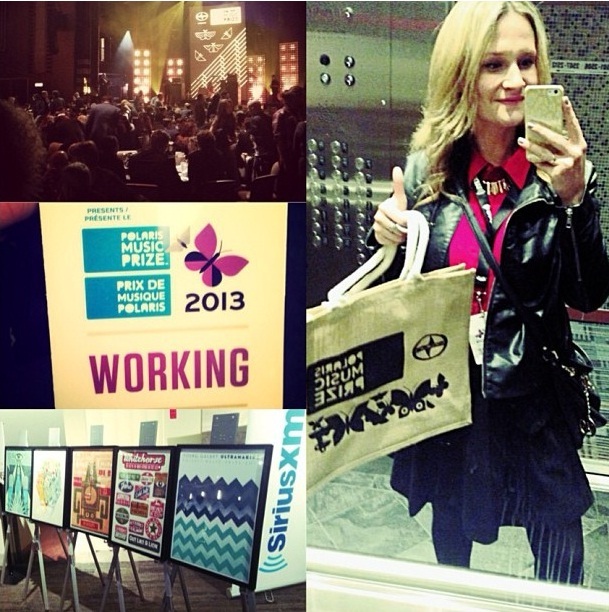 On Monday night, I ended up the only non-juror allowed in the 2013 Polaris Music Prize grand jury room. From the time the lights flashed and Canada’s most esteemed musicians were summoned to their gala seats – I, who was working the event, closed the jury room door and stayed quiet. As you can imagine, an impassioned discussion about music was not an easy one for me to press mute for. 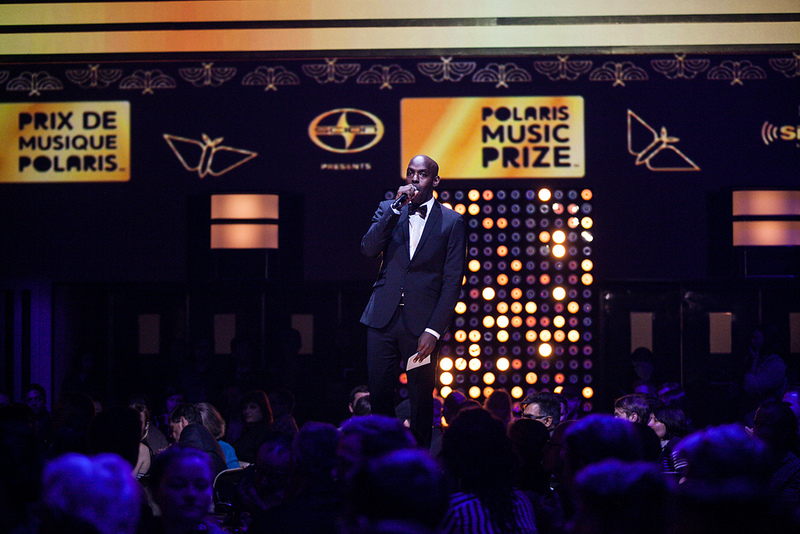 The coveted Polaris Prize might not mean much to someone who doesn’t follow Canadian music; the same way the MET Gala or TIFF might not mean anything to those who are indifferent to the fashion or film industry. In terms of respected, challenging Canadian albums of the year – not the kind that might questionably populate the much larger JUNO Awards list – Polaris is the treasured Canadian music tribute; a one-time prize and stamp of quality, meaningfulness and integrity decided by some of the country’s most seasoned pop culture critics. 11 of them, to be exact; 11 who I sat quietly with for the duration of the three-hour deliberations. 11 who, like me, were the only people tucked away from the televised gala in a room – prohibited from snapping photos, tweeting, texting or anything else that could prematurely reveal which way the 2013 jury was swaying. Each year, a different batch of influential music critics are chosen to select the best Canadian album of that year. Sampling an array of genres, a 200-person group of local and national media submit their choices for the prize’s long list. From there, a short list of ten are chosen. And from there, the 11-person jury selects the final winner during this prestigious evening in music. Sitting in that room with trusted music critics, broadcasters and personalities, listening to them state their arguments around how to trim the list from ten, to five, to three, to one – it’s hard not to feel incredibly alive as a Canadian arts enthusiast. Because, even if it isn’t your forte, it’s a beautiful thing to know that there are people out there whose lives are devoted to caring so deeply about music and the place it holds in our society. I believe we are all infatuated with some bit of music to a certain degree, but in listening to my peers debate the artistic merit of these impressive short listed works – it was a wonderful reminder of those with such undying passion for all types of Canadian artists. In reviewing music and evaluating the role it plays in a given year, the discussion has much to do with each critic’s preference, of course – but, more so, it has to do with encouraging and feeding discussion of the arts. It has to do with deciding, in a particular point in time, who to champion in Canadian music; who to support, who to validate as an artist who poured months (or more), money and heart into a work of art consisting of words and sounds that would hopefully better the cultural landscape. It came down to not only deciding which album represented something in 2013, but, more so, which album was fantastic. Which album and artist, quite plainly, made people really feel something. Whether film, visual art, music or anything else that enriches our daily motions as human beings – it’s inspiring to, every now and again or for one night only, reward creativity and celebrate what makes us feel. Even on mute, I was delighted to be a part of that. For more information on the nominees and winner, visit www.polarismusicprize.ca. Banner and first photo c/o Connie Tsang.